I'm simply overjoyed and in tears right now. I've been championing HIV+ prisoner Betsie Gallardo, who was jailed for five years for spitting at a police officer. I asked for a Christmas miracle for Betsie - that she be released to die in peace. Mainstream media and other bloggers picked up Betsie's story and soon Florida legislators, HIV activists, Bilerico contributors and readers, and Haitian activists were clambering for Betsie's release. Last night Florida Representative Daphne Campbell (D-Miami) and contributor Michael Rajner took Betsie's mother to Governor Rick Scott's inaugural ball to plead for her release. 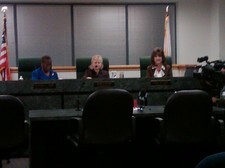 The Florida Parole Board met in an emergency meeting this morning to hear Betsie's case. The board approved a conditional medical release in a 2 to 1 vote; Betsie is being released to a Miami hospice to live out her final weeks of life surrounded by her family. She is currently on house arrest and will only be allowed out of the facility for medical appointments and church services. I'll update this post with footage from the hearing and a statement from Betsie's mother soon. While I asked for a Christmas miracle for Betsie - and meant December 25 - Orthodox Christmas isn't for another two days. Betsie should be officially released tomorrow morning. We did it, Projectors. We got our Christmas miracle. I wanted to personally thank you and all of your readers for the amazing outreach you all provided to Betsie and the rest of our family. You personally led the media crusade that ultimately made all the difference and, as a result you've given my daughter her freedom! The parole commission has agreed to grant Betsie a conditional release that will allow her to leave the prison ward at the hospital and enter a local hospice. The terms of this release are similar to house arrest. Concurrent to having her released to hospice, we'll be processing her transfer back to Indiana. This is somewhat hindered by the lengthy bureaucratic machine associated with interstate prisoner transfer. We hope that we can complete this step while my daughter is still able to travel. Rep. Daphne Campbell, who has championed Betsie since she became aware of her situation, continues to work on her behalf. As soon as the parole commission announced their decision, Rep. Campbell headed to the capitol to continue the conversation that we began with Governor Scott last night at the inaugural ball. Her goal is nothing less than to have the Governor grant Betsie unconditional release so that she can travel home immediately. Keep the good energy flowing. Perhaps we can still get Betsie back to Indiana before it's too late. That said, we've definitely scored a huge victory. In closing, let me add that in spite of my joy at Betsie's release, I'm still sorely disappointed in my daughter for the actions that landed her in prison in the first place. While I completely disagree with any law that criminalizes AIDS, I have nothing but sympathy for the fear and harm she caused to the officer that she assaulted. That officer remains in my prayers. I need betsies mom jessica to plz contact me. I have some of. Betsies personal belongings along with important papers n stuff of hers n pictures that were left with me wen she became incarserated last nov 09. She is a good friend of mine n she stopped writing me n october. My email is [redacted for privacy reasons]. Note from Bil: I've passed your note (and e-mail address) along to Jessica. And Jessica, I don't know you, but your grace under pressure, and your well-stated message to the arresting officer, are just pure class. I am so glad that Betsie got some approximation of compassion -- And thank you to Bil and all the blog readers who weighed in with the authorities on this. All this over spitting on a cop -- what a travesty this whole episode makes of the idea of American justice. Something positive from Florida!! Shocking but terrific news, Bil and Jessica. Good job, everyone! And especially to Bil for pinging the right people on this. Betsie can live out her days with people who love her and who she loves. Jessica, you're a more compassionate person than I would be. Great role model! !